If you own an iOS device, there’s a good possibility that you’ve needed to free up some space by deleting unused apps. Unfortunately, it’s not possible to see a specific app’s size from the home screen. Luckily, a Cydia tweak developer has stepped in to provide a possible solution. 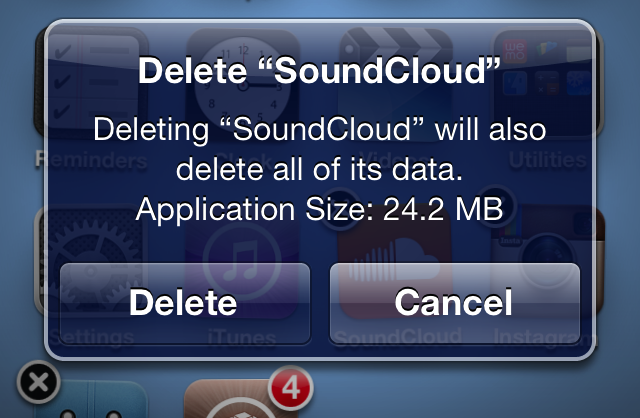 Uninstall Application Size will list any app’s size in the “Delete” prompt. Once you’ve installed this tweak, put your apps into wiggle mode and attempt to delete one. The alert that pops up before deleting an app will now provide you with its size. This may be a very simple tweak, but it definitely provides you with useful details before deleting an app. Prior to now, you’d have to go into the Settings app, navigate to “General,” tap on Usage, and scroll through a list of installed apps to find this information. Uninstall Application Size simplifies this process and puts the information right on your home screen. The only downside is, you’ll have to tap on each app to list its size. This isn’t meant to be a replacement for the default usage list in iOS, but it will immediately let you know how much space you’ll gain when deleting an app. Currently, Uninstall Application Size is available in the BigBoss repository for free. It may not be for everyone, but in my opinion, this tweak provides a useful piece of information. There are no settings to configure for this tweak. For other Cydia tweaks, check out: Cydia Tweak: CocoaNuts’ Celeste Sequel Is Set To Launch Soon For iOS 6, VideoPane Offers Picture-In-Picture Video For iOS, and Cydia Tweak: TypographyTime Makes Its Way To Notification Center.